Aristide, a tyrant in Washington, D.C.
December 2nd, 2002, 5:30 p.m. to 7:30 p.m. Mimi's American Bistro, 2120 P Street, NW Washington, D.C.
TransAfrica Forum invites you to an evening in support of TransAfrica Forum, highlighting the fight for Haitian sovereignty on Monday, December 2nd, 2002, from 5:30 p.m. to 7:30 p.m. The event will take place at Mimi's American Bistro, 2120 P Street, NW, Washington, D.C. In spite of national sovereignty, the United States has blocked $500 million in aid to Haiti based on claims of mishandling of the internal political situation by the Haitian government headed by President Aristide. The policy of the United States toward Haiti has deepened the immense poverty that has become so common for most Haitians. 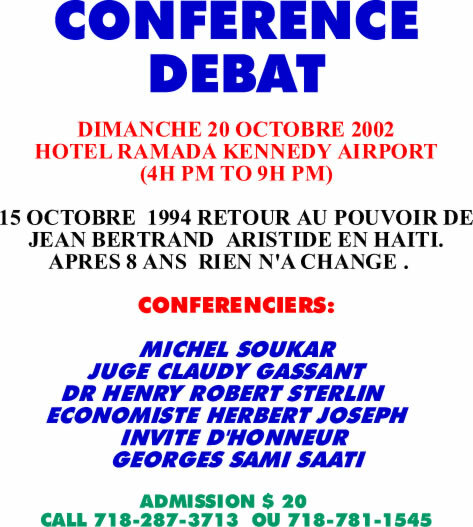 With your financial support, we hope to build momentum for our campaign for Haitian sovereignty. Saturday, October 19, 2002 8:30 AM - 2:00 PM Madison Park High School, Boston 55 Malcolm X Blvd. / New Dudley Street Boston, MA 02119 A conference for educators, school service personnel, after-school program directors and youth service professionals. Children experience violence in many forms, incurring great human losses and suffering deep emotional trauma from these experiences. Many as a result have feelings of pain, anger, confusion, guilt and restlessness. As educators, we are often faced with the debilitating effects of such losses and trauma on our students. The Teachers' Peace Conference will expose you to the Louis D. Brown Peace Curriculum, an effective tool to teach the values of peace and peacemaking, and our experienced presenters and facilitators will help you develop skills to deal with grief in the classroom and use Community Service Learning and Storytelling to improve learning.